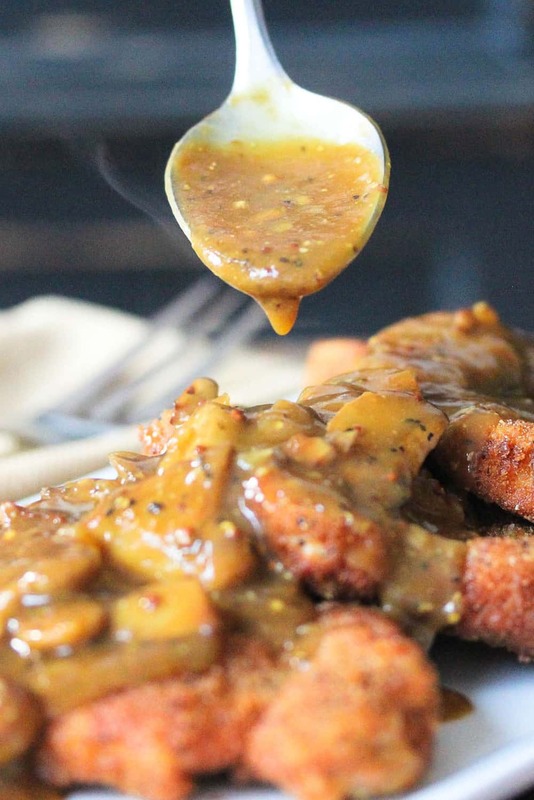 Oh, this German Schnitzel with Mushroom Gravy is just so satisfying. Back in the mid-90s, I performed in the musical “Cats” in Hamburg, Germany for well over a year. The Loon came over and stayed with me. We had the time of our lives, and certainly enjoyed a lot of Schnitzel. 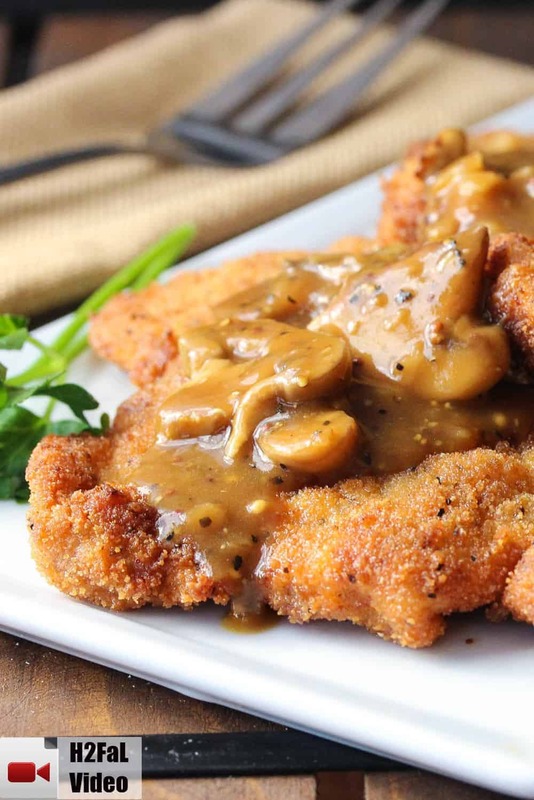 This German Schnitzel with Mushroom Gravy is so comforting, and really simple to make at home. 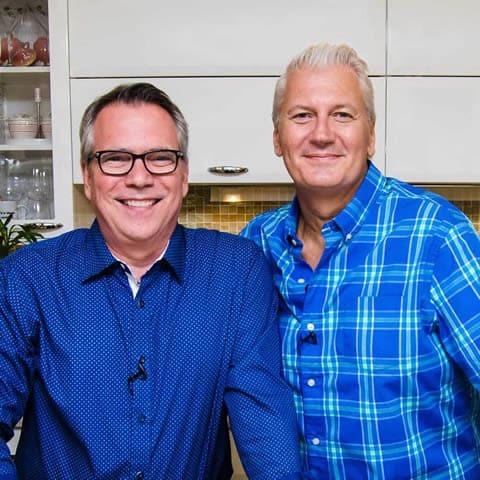 Watch us show you how to make this amazing dish! 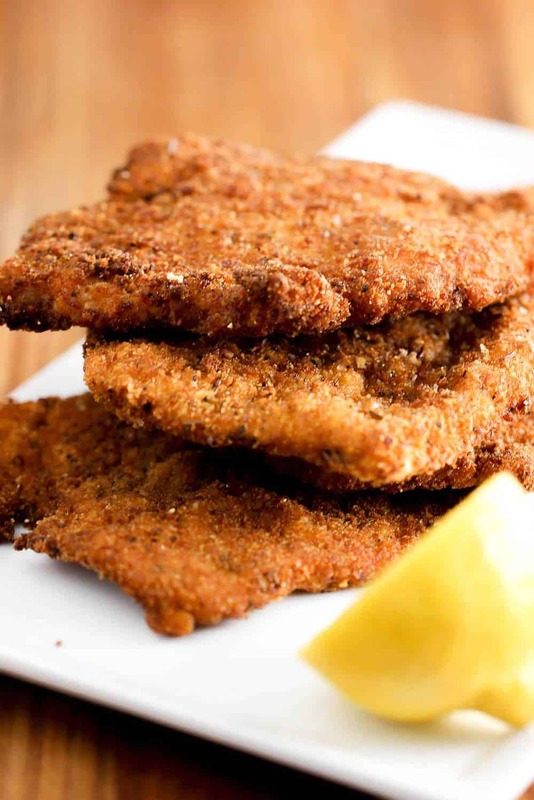 We get a lot of comments from folks reminding us that schnitzel originated in Austria and authentic Weiner Schnitzel (from Vienna) is made with veal. We know that! But, we love it also with chicken or pork. For this version, I took a nice boneless pork chop, and pounded it down to a thin 1/4″ cutlet. After seasoning the chop with salt and pepper, it goes through a simple dredging process of first in flour, then a quick egg batch, and then into the lightly seasoned bread crumbs. There is just something so tempting and satisfying about a perfectly cooked chop. Thin and crispy on the outsides and flavorful on the inside. As with almost any dish, it’s even better with a sauce. So, I added a lovely brown sauce with sauteed mushrooms, beef stock and whole grain mustard. This is a classic German mushroom sauce called a Jaeger sauce, which means “Hunter Sauce.” Schnitzel, of course, originated in Austria, actually in Italy, which would become Austria. As this German version (which includes the German gravy), there are many different variations. Read more about it’s amazing history here. All we know is that it truly is wunderbar! By the way, if you like this German Schnitzel with German Gravy as much as we think you will, you would probably also really like our Pork Milanese as well as our Chicken Francese. And beside amazing taste, the other great thing about the dish is how easy it is to prepare. It’s elegant enough for a nice dinner party, but easiest to whip up for a delicious weeknight family dinner. I mean, just look at this dish!! 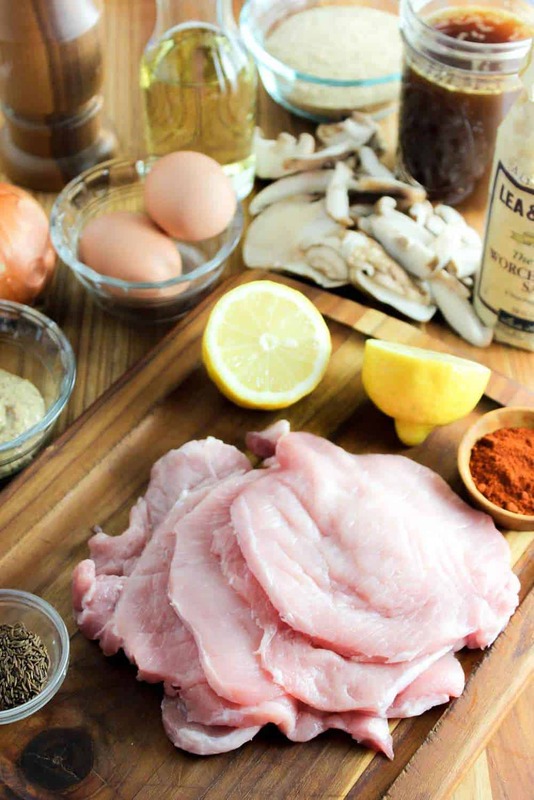 Now, go forth and make this amazing German Schnitzel with Mushroom Gravy recipe! This German Schnitzel with Mushroom Gravy is so flavorful and easy to make, even on a busy weeknight. Use veal, pork, or chicken...pound the cutlet out thin...bread, whip up the sauce, quick fry...and you are set! So delicious! Add the garlic and saute for about 1 minute. Add the onion and cook for another 4 minutes, or until translucent. Add the mushrooms and cook until they start to release liquid, about 4 minutes. Add the flour and stir to incorporate. Add the wine, stirring to combine. Cook until the wine reduces down, about 4 minutes. Add the stock, and stir frequently . The sauce will start to thicken over the next 5 minutes. Stir in the mustard, Worcestershire sauce. Heat the oil in a large, sturdy skillet over medium-high heat. Pound the cutlet between wax paper, or in a large freezer bag, by using the side of a meat tenderizer. Pound down to about 1/8". Trim any jagged sides, and/or excess fat. Place the flour in one medium-sized bowl. Place the eggs in another bowl and gently mix together. Mix in another 2 tablespoons of water. In a third bowl, mix together the bread crumbs, salt, pepper, paprika and caraway seeds. 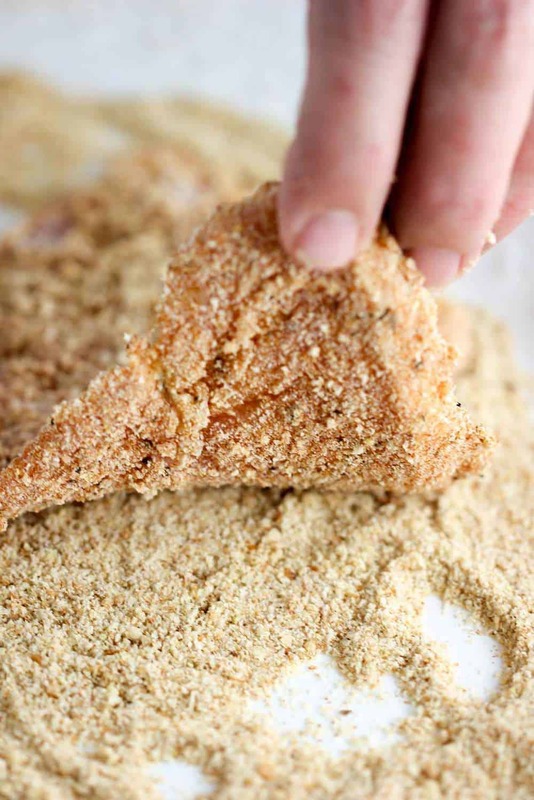 Dredge each cutlet in the flour, then dip in the egg wash (shake off excess), then dredge in the bread crumb mixture. Fry each cutlet (don't overcrowd the pan) for about 4 minutes per side, or until golden brown. Serve with gravy poured over top and garnished with lemon wedges and parsley. Making this … again … and can’t wait to dig in! This is an amazing recipe and the sauce is to die for. I serve it with spaetzel and red cabbage. Wunderbar! And I couldn’t agree more … Germany is a beautiful country with wonderful people (and, for the record, I’m not German!). We can’t wait to visit again. Thanks for this wonderful recipe, Kris, which will help hold us over until we get back to Bavaria! Aufwiedersehn! I like to make dinners ahead for my mother. Can this dish be frozen and reheated? I have printed your recipe and I am following your recipes!! THANK YOU!! With the passing my Oma (who didn’t believe in written recipes) we lost the recipe for her Jagerschnitzel with her all those years ago. While the pork cutlets were easy enough to remember how to make, the gravy was not as easy. This recipe is the closest I’ve found to it! Thank you so much for sharing this and bringing a piece of my Oma back to me, it helps bring a bit of her magic to my children. I lived in Germany for 4 years and simply loved it, the food, the people and the way of life. Weiner schnitzel with this mushroom sauce was my first introduction to German cuisine, but I could never find a recipe like the one I first tasted until now. This is even better, and has brought back so many fond memories. Thank you guys for sharing this. I’m now looking for a good Rouladen recipe. 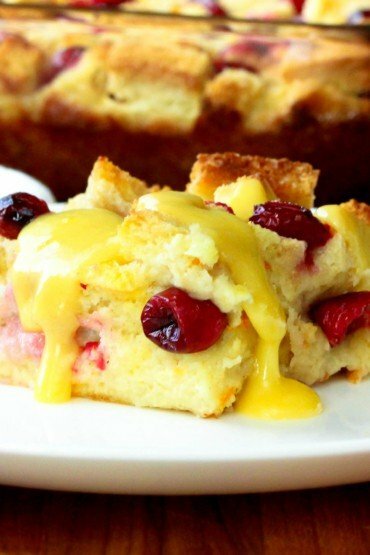 Thank you for sharing this super easy and fantastic recipe! I made this the other night for my husband’s birthday, and he absolutely loved it. The meat was crispy on the outside, yet very tender and juicy on the inside. Also, the gravy was phenomenal (I personally loved the tanginess from the Worcestershire sauce and mustard). I served this with garlic mashed potatoes, fresh vegetables (broccoli, green beans, corn, peas and carrots), iced tea to drink, and I bought a cake for dessert. Overall, it was a wonderful evening – and considering I made this in under an hour on a weeknight was also a bonus for me. This is something you would not want to eat on a regular basis, but this is definitely a delightful treat to have once in a while. Again, thank you for sharing this. I will definitely make this again. Awesome, Mark!! We love that schnitzel with the mushroom gravy so much. And we are so glad to hear that you and the family did, too! Really makes us so happy to hear. I have not done the Italian Boot Camp at CIA, but I’ve considered it. They also have an Asian Cuisine Boot Camp that I’d like to go to. I went to a 7 day boot camp that was intense but really amazing. I had a lot of fun, learned some things, and gave me the further confidence of the skills I already had, but needed a little confirmation! I would highly recommend it! Keep us posted! Thanks again and have a wonderful holiday!! Did this for dinner last night. Used chicken breasts and broth. Served with hot buttered spatzal on the side. Yuummmmy. Kris, Loon, I’m drooling ova here!!! in anticipation for my expected bragging rights as I choose your recipe for my WienerSchnitzel N gravy go-to…. It’s my first time cooking one of my favorite dinners. I’m showing my Schnitzel a good time and making room for a lil Spätzle on the side, (I’m so cheesy but must admit that last statement was trying to force a smile upon ya’ll, haha)Sendin you both return smiles in admiration of your mission, the huge-yet sometimes unseen rewards gained in a life full of the ONE universal Law: Great food amongst your family and friends brings smiles. Awesome! You’re going to love it and people will definitely be impressed! Let us know how it turns out! And thank you for you kind words. Stay in touch!! All the best, Kris & Wesley (The Loon). I decided that my plain old schnitzel wasn’t going to cut it tonight. So, I decided to go with a Jaegerschnitzel and it was spectacular. The sauce was great and made the usual apple sauce unnecessary. I used button mushrooms which I thought you mentioned in the video…and they were fine. Did your recipe actually suggest crimimi mushrooms? So glad you liked the schnitzel and we agree, we really love the mushroom sauce! Yeah, I suggest crimini, but any variety would work. Thanks again! Keep us posted on other recipes you try and we’ll keep adding new recipes every week. Just stumbled across this- love you guys already but wanted you to know that “wiener” doesn’t mean “veal” . “”Wien” is the word for Vienna, so it means “Vienna style” schnitzel. So happy to find this recipe! I’m making this tonight. I was craving a restaurant dish I had years ago and didn’t know how to describe. Your recipe ticks all the boxes. Most mushroom schnitzel recipes online call for a sour cream base, but that is just stroganoff to me! I can’t promise it will look as pretty as yours, but I’ll post an update after we eat. Awesome!! Please let us know how it turns out. We just love mushroom schnitzel!! Stay in touch! Thank you so much for the note! Did you try the recipe? Hope it turned out fantastic!! Let us know when you have a chance. All the best, Kris & Wesley. Just letting you know that I made your German Schnitzel with Mushroom Gravy last night in cold and wintery Melbourne, Australia……absolutely delicious, thank you! The smoky paprika and the caraway seeds are the perfect flavours in the crumb coating and the mushroom gravy has a little bit of a tangy flavour from the Worcestershire sauce which offsets the richness beautifully. I’ll definitely be making this again! Many thanks. Sandra, thank you so much for your note. I have to say, this dish is one of our all-time favorites. There is something about it that is just so satisfying. I’m glad we can connect, even though we’re half a world away! It’s cold and Winter in Melbourne where you are, but it’s blazing hot here in NYC, where we are. I’m glad H2FaL could bring us together, regardless. Let us know if you try any other dishes…and lots, lots more to come. All the best, Kris (& Wesley). Kris, I haven’t blogged about this yet, but made this schnitzel last night and it was SO GOOD!! The gravy was so good and the seasonings for the breading on the schnitzel were perfect! Love, love, love!!! That’s awesome, Lisa! That is one of my favorites, too. I added the mushroom gravy last time I made it for the site, and really thought it made a huge difference. Happy Summer! See you on ‘www.thepincidentalfoodie.com’! !